The tournament hosts, Chile, will face the defending champions, Uruguay, in the Copa America 2015 quarter-finals on June 24th in Santiago. Chile were by far the best team in the group stage of the competition. Carried by the passionate home supporters Alexis Sanchez and his teammates have scored 10 goals so far, which is more than double compared to any other team in the tournament. La Roja finished on top of their group with victories over Ecuador 2-0 and Bolivia 5-0 as well as a 3-3 draw vs. Mexico. Some other notable names on the Chilean team are the Barcelona FC goalkeeper Claudio Bravo, Napoli forward Eduardo Vargas and the aggressive Juventus winger, Arturo Vidal. Uruguay have underperformed so far in the tournament. They finished third in their group after beating Jamaica 1-0, losing to Argentina 0-1 and drawing with Paraguay 1-1. La Celeste are very much missing their superstar striker Luis Suarez, who is still serving a suspension from last year's FIFA World Cup. It is now up to the Atletico Madrid defender Diego Godin and the PSG striker Edinson Cavani to try and push their national team forward. The host nation, Chile, are the big favourites going into this game despite losing to Uruguay 2-1 in a friendly back in November. The winner of this match will face either Bolivia or Peru in the semi-finals and then potentially, Argentina, Colombia, Paraguay or Brasil in the final. 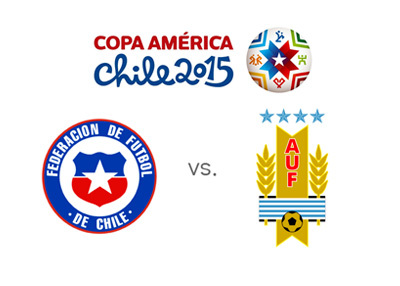 Let's see how things play out in the so far underwhelming Copa America 2015. Can Chile go all the way? Will Cavani and Uruguay wake up?